Halkidiki Οlimpiada is on the third finger of Halkidiki. It is 100km away from Thessaloniki airport. Therefore it takes 87min to get there. Olimpiada is a coastal village. The noteworthy landscape of the place, its clear waters, and the beaches it has, are some of the best in Greece. It is worth to mention that the beaches of Οlimpiada gets the blue flag award the last years. Therefore Οlimpiada is a popular tourist destination. Choose one of the many apartments and luxury hotels that are located in Οlimpiada , in order to enjoy your visit there. Select date and time of Departure. Select Pick up location “City Thessaloniki or Thessaloniki Airport”. Choose after that, Olimpiada for Drop off location. Insert then the Number of passengers (including Children). Choose either one-way transfer or return transfer. Choose the vehicle you want. Add your extra items (such as luggage etc.). Write on the “billing details” form at the “Additional Informations” your location address and other informations likewise the Name of Hotel . 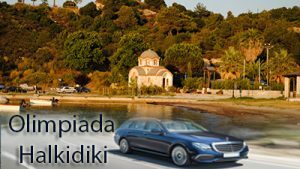 Thessaloniki taxi transfers undertakes your transfer from Thessaloniki airport to Olimpiada in Halkidiki, with comfort, safety and reliability above all. First ,our luxury Mercedes E class cars are always clean as long as in an excellent condition. Meanwhile our polite, helpful drivers are willing to undercover what a passenger needs . In conclusion, our experience, the high quality of our services and the low cost charge, offer a rather comfortable and safe journey.